And probably for the first time ever, I have to confess, I'm really, really relieved. March has, for many years, been a hard month for me. It's hard every year because we administer our state's standardized test. And which drains me to the depth of my being. This year though was especially hard. In September, my youngest son went to college. I'm a single, never married adoptive mom and the house has been very, very quiet. Some people might think, how great, now you can do all the things you used to do or love to do and haven't done for the last ten years, as you've been raising the boys. To some degree, that's true. But as hard as it's been, I have loved being a mom. High school was hard, but I loved their elementary and middle school years- taking them to practices, watching their sporting events, having their friends in my family room on Friday nights. I miss that. And I worry a lot about my boys. College isn't going all that well for Son #1. He's a tremendous athlete with dreams of playing in the NFL, but he's also a kinesthetic learner, who really struggles in school. I haven't seen him since the first week in January, but his voice on the phone is angry and tight, which is never a good sign. And Son #2 is telling me that the coaches don't like him and he wants to switch schools. And I sit in Denver, 900 miles away, praying for mentors and for wisdom to know how to advise and support my boys. It's hard to slice about them right now. And then on February 17, I got a call that my mom had collapsed. The doctors thought she had had a stroke, then had a brain tumor, and finally decided she had water on the brain (which I have since learned is a common condition in the elderly) and needed a shunt installed. And overnight, she went from being a vital, lively, well-read 80-year-old woman living in her own house and driving her friends around in her SUV a to someone who uses a walker/wheelchair in assisted living and is struggling to read People magazine. She's getting better, but things will never be the same. And I'm missing horribly the mom I used to have. The one who met me for lunch. Who had read every bestseller ever written. Who supported me through thick and thin. I have written a few slices about my mom, but they are all really sad. And I finally decided that people would get sick of those and I couldn't write anymore slices about my mom because they were all basically the same. My sisters and I have been cleaning out my mom's patio home. I've written a few slices about that and people have responded that it's so great that we get along so well and have pulled together. But the truth is that my sisters and I have a very precarious peace, which is best maintained when we don't see each other very often. And we have seen each other every weekend, all weekend, for the past five weeks. And things get tenser every weekend. My sisters don't really know me or my boys at all. And that makes me really, really sad. I've started several slices about my relationship with my sisters, but the words don't come together. Those slices sit as unfinished drafts on my blog. And so I'm glad March is over. I'm glad I have written the last of these 31 slices. Because March has been a long, hard month. And I'm really glad it's over. Yesterday I wrote about how disheartened I'm feeling that so few teachers in my building are readers. On the other hand, I have kids, urban kids who come from homes where parents aren't well-educated, don't have money to buy books or go on vacations and speak English as a second or third or fourth language, who are in the process of becoming readers. Here are a few snapshots from Friday. Friday morning. 9 a.m.. V waves when I walk in the door to his seventh grade Language Arts class and I walk across the room to greet him. This guy is an avid reader. He finished the Lord of the Rings trilogy in less than two weeks and needed something else. I gave him ERAGON less than a week ago. "I'm almost done with the book," he says. "Really? You need something else for break?" "I'm not sure," he says. "It's nine days." I head for the library and pull out ELDEST AND BRISINGR. The librarian is busy with a group, so I leave her a note, then return to the classroom and tell V to pick them up in a little while. Later I run into the GT teacher, who also works with V.
"His father doesn't like all this reading," she tells me. "He told me yesterday he has to sneak and do it behind his back." "Really?" I say. "Do you want me to call?" "I already offered," she says. "He told me it was ok. That his mom is ok with it so he would just read when his dad was at work." She continues. "I was kind of surprised. His mom and dad have always been really concerned about his academics. They really want him to be the first person in his family to go to college. We've talked a lot about how important it is for him to read as much as he possibly can." 11:00. I meet with my second grade intervention groups. We've spent most of the year working on unknown word strategies and are now working on building fluency. One of the ways we are doing that is by reading series books (not to be confused with serious books, which is what J calls them). One group is reading HENRY AND MUDGE. A second group is reading CAM JANSEN. I prepare book bags for Spring Break. Each Henry and Mudge bag contains three books and a high frequency word list. The Cam Jansen bags have two books and a word list. My second graders cheer when I pass them out. It is after 5, Spring Break started two hours ago and the building is almost empty when I climb the stairs from my basement office. I am surprised to see L still standing by the front door. She tells me that she is waiting for her mom, who is ten minutes away. "Got any plans for spring break?" I ask. "Yeah," she says. "I'm going to hang out with B (her best friend). We're going to do stuff." "What kind of stuff?" I ask. "You know," she says. "Fun stuff." "Oh, you know. Swimming. Going to the mall. Shopping. Going to the movies." "What about reading?" I say, expecting her to wrinkle up her nose. "Yeah," she says, smiling. "I'm reading a good book." "You are? What is it?" "It's called HOOT," she says. "But I can't remember the author." "I've read that one," I say. "It's Carl Hiassen. If you like that one, you would probably also like FLUSH, by the same author. And then there are a couple of other similar ones." "Really?" she says. "I'm gonna look for them." "You should," I say. "He's a great writer." "Ok, well, have a good break," she says, as her mom pulls up in front of the school. "You too, sweetie, read a lot." For as long as I can remember, my mom has been the laundry goddess. She's one of the few people I know who absolutely loves doing laundry. And she's really, really good at it. ringless collars, creases aligned, no leftover spots. could make them all disappear. So my sisters and I have taken over. and the hamper was overflowing. I pass the signs out at the weekly faculty meeting. There's a space at the top for the name. Underneath that, it says, "Over Spring Break, I am reading ________________." I want teachers to fill out the posters and hang them in the hall by their classrooms. I want our students to see their teachers as readers. I want us to model the idea that readers have ongoing plans. I don't have any trouble thinking of titles for my own sign. First, I'm hoping to finish BOOK THIEF (I have had 75 pages to go since the weekend my mom had her medical issues). I also want to finish Cynthia Lord's newest, HALF A CHANCE, which I started last weekend. And I want to read BEHOLDING BEE, which has been overdue at the library for about two weeks now. Oh, and my book club is meeting on Wednesday, and I am supposed to read Sue Monk Kidd's INVENTION OF WINGS. And I should read TANGERINE, because the 7th graders at school will be reading that book when we get back from spring break. As far as professional reading, I've got Diane Ravitch's REIGN OF ERROR and Chris Lehman and Kate Robert's FALLING IN LOVE WITH CLOSE READING. That's seven books I want to read in the next nine days. I wonder how I will ever find time to clean my house, grade papers, or do my taxes. I am surprised, then, when most of the people on my staff have trouble thinking of something they will read. In fact, less than half the teachers on my staff plan to read a book over Spring Vacation. Two are new moms and wonder whether they can count the board books they will read to their little ones. Several others mention newspapers or magazines. A few more say they might read a professional book or article.They fill out the posters half-heartedly. And only half actually get hung up, even after I put out an email thanking people for hanging them. I leave the meeting feeling more than a little disheartened. How can we ask kids to read for 20 or 30 minutes a night, if we don't commit to that same measly twenty minutes ourselves? How can people recommend books to kids or run a successful readers' workshop if they aren't reading? And maybe most importantly, how are we ever going to help kids become readers if we don't see the value of reading in our own lives? Last weekend, when I was walking my dog, I saw my first daffodils. 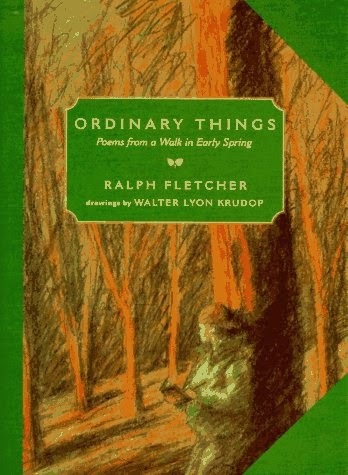 And it made me think of one of my all time favorite poetry collections, Ralph Fletcher's ORDINARY THINGS: POEMS FROM A WALK IN EARLY SPRING. The book was first published in 1997, but I love it, and drag it out to read to kids (and myself) every spring. And every spring, after I see my first daffodils, I feel compelled to post this poem. Mary Lee, who is about to reveal an amazing poetry challenge for April is hosting POETRY FRIDAY today. Lots of good stuff will be shared! I have been asleep for almost two hours when the house phone rings. and head down the hall to the family room. Has something happened to one of the boys? Is someone in the hospital? Or in jail? stuck down the side of the couch. And then it stops ringing. I hardly ever use this phone and can't remember how to locate the previous caller. I call Son #1, my night owl. "Did you call?" I say. "No," he says adamantly. "Why would I call this late?" "I don't know," I say, still trying to shake the sleep from my head. "But the phone just rang, and I thought it was you." "Well it wasn't. Good night." And he hangs up on me for the second time in one day. Then I call Son #2. "Did you just call?" I say. "I wanted to remind you to put money in my account tomorrow." "I put money in your account every Thursday." "I know. But I wanted to make sure you remembered." "No. But I need gas." "It is. It's 12:06. Do you know what I was doing?" "I have to get up in about three hours." not late at night. Or send a text." "I don't like to get up in the morning. And I wanted to make sure you remembered." And I don't like to be wakened late at night." "Good night. I love you." I lay in bed for an hour, finally going back to sleep about 1:30.
on approximately 2.5 hours sleep. I am sitting in the DMV waiting for new license plates when my phone rings. It is Son #2. I text him, "I'm at the DMV, you ok?" He texts back, "I want to go to GCC (the school where Son #1 goes). I am not sure what to say. I text "?" He texts, "They're sitting me." He texts again, "Zay says I can play quarterback.."
I text back. "What do the coaches say?" He doesn't respond. When I get done buying license plates, I call. He tells me the coaches are mad because he has been missing practice for his job. The job I told him to get. They have told him he cannot play spring ball. "All of the D-1 coaches will be there watching," he says. "And I won't be playing." I don't know what to say. I feel like I am getting about half of the story and I wonder what is really going on. In the past, work ethic has been an issue and I wonder if that is what is going on now. I wonder what the appropriate parental response might be. And then he says, "Well you are clearly not going to give me the support I need." And hangs up. Son #1 texts me mid-morning. "If you write a check, I won't get it for a day, so you need to put my money in today." I am rushing through my day. I do not have time to text back. I know I can't get to the bank until after it closes because of an after school meeting. I wonder if it is really true that they won't put the money in the bank until a day later. I ignore him until after school when I notice that he has called three more times. He answers the phone after about five rings. It sounds like he has been asleep. Our connection is bad and I have trouble hearing. He gets mad and tells me to hold the phone to my ear. I tell him that I cannot put money into his account until the bank opens tomorrow morning. I do not call back. Instead I spend the evening wondering if he is ok. Wondering whether he has food. Wondering where all his money is going. I do not know how to parent these two man boys. I meet A in the cafeteria the first week of school. She is new at our school, doesn't have lunch money and some of her seventh grade peers are concerned. They wonder if I can help her get some lunch. As she eats in the almost empty cafeteria, we chat. I learn that A's mom is in jail, that she is living with an older sister and a toddler nephew, that she is interested in coming to school to see friends, but thinks reading and math are boring. Over the last six months we've become friends, and she drops by to say hello on a pretty regular basis. Today, I run into her in math class. The class is supposed to be doing a math lab on the computer, but A's best friend, J, is providing a floor show, much to the first year teacher's chagrin. A is sitting beside her, not really participating in the comic chaos, but not getting the math lab done either. I kneel down beside her. "What's going on?" I say, tapping the computer screen. "I don't know how to do this," A says. I'm a little surprised. A is a bright girl and this activity, having to do with dividing positive and negative numbers, seems relatively simple. "Yes, you do," J suspends her show and interrupts, glancing at the screen, where the problem -54/6 is displayed. "It's -9." The computer deems J and A's work "Brilliant" and then advances to the next problem. "-42/-7, that's 6," says J authoritatively. "Very good," says the computer, and the screen advances again to -30/5. J solves that one too, and then several more after that. A reaches for the pad of post-it notes in my hand and writes me a note. "I don't know how to divide." I am surprised. A is a bright girl and we have a great math teacher. I write a note back. "You don't know how to divide, or you don't know how to divide positive and negative numbers?" A writes again. "I don't know how to divide at all." I take another post-it note. "Would you like someone to teach you?" This time she has a one word note. "YES!" Another note from me, "Would you like me to teach you to divide?" And another one worder from A, "Yes!" Another pink sticky note: It won't take us that long. You know how to multiply?" Another sticky note: Well, then, division will be easy-peasy lemon squeezy. It's just the opposite of multiplication. A looks at me doubtfully and writes another note. "OK."
I slide another note across the table. "So when do you want to start?" A writes again. "I don't know. I 'll ask my mom." I think about the rest of this week and write, "The week after vacation would probably work better for me. I can do Tuesdays, Thursdays, or Fridays if you want." This time A nods. Our conversation is over and she turns her attention back to her friends. I'm so glad I walked through that classroom this afternoon. So glad I had a pad of sticky notes in my hand. So glad I get the privilege of caring for kids like A every single day. Teaching. It really is the best job in the world. We have spent the last three weekends cleaning out my mom's house. And every Sunday night, after I come home and unload the car into my 1100 square foot bungalow, which is now beginning to resemble a storage shed, I tell myself that I am not going to bring home ONE. MORE. THING. Just. SAY. NO. I tell myself firmly as I drive to Colorado Springs. But every Sunday night, I come home with another load of stuff. You see, I am the keeper of the paper in our family. "The Childhood Museum" by Janelle Wisby- The Childhood Museum is a wonderful place. There are not only pictures, but many other works of art. In a month or two, two of our pictures will go on sale. They are both large and good. They cost from $1.60 to $1.80 apiece. Come see them while they are up. Don't be too slow or you won't ever see them. "We Need You" by Janelle Wisby. We need you. There is a museum at 2024 Chelton Road. There are about 50 pictures in it, plus many to sell. We have a donation box. When you donate, we buy supplies, do more pictures and sell more pictures. Do you think you could look through the museum? I hope so! But remember we are not at home all the time. "Where is Tommy?" by Carol Wilcox- Tommy went to art lessons every Monday at 3:00. He came home at 5:00. One day Tommy was not home. 'He's just doing his painting," thought his mom. It was 6:00. He wasn't home yet. Mrs. Dunn was worried. At 6:30 in walked Tommy. "What Art Can Do" by Carol Wilcox- Art can brighten your home or make you happy. A sick person can use art to make him happy. Art can also be fun and keep you out of trouble. If you go to your grandmother's house without your mother or father, a picture makes you happy. A picture has a cheery look. I also contributed several poems to the newspaper. I do it with Mike. Me and Mike are alike. I also brought home a file of my mother's Christmas letters for the last twenty years, the prayer I wrote and shared at my dad's funeral in December, 1993, as well as the sympathy cards from his death, my mother's recipe boxes, in case I ever decide I want to cook, and the dissertation dedication I wrote and sent to my mom shortly after my dad died. I know I really can't keep bringing stuff back to my house. But I really can't help it. I am the keeper of the paper in my family. My mom has moved from a 4000-square-foot patio home to a one bedroom apartment in assisted living. She had a lot (LOT?) of stuff, so my sisters and I spend part of every weekend cleaning and sorting and tossing. It's been an "interesting" process- one of my sisters purges everything extra from her life on a regular basis, I think everything has sentimental value and should be kept, and my youngest sister wants to keep some stuff, but has a husband who doesn't want any of it. Last weekend, we did the books. My mom has always been an avid reader. She has mostly always been a buyer, not a borrower, so we had hundreds, maybe even a thousand books to sort through. My mom read bestsellers, e.g. GONE GIRL, but she also was prone to pick up a book every time she went to the grocery store or Target. I had already told myself, firmly, that I was not bringing home all of her books. I have many of the best sellers (or had already borrowed them from her and returned them). I don't read the grocery store junk (unless I am at her house with nothing else to read, which has been known to happen). And I do not have ANY. MORE. ROOM. for ANY. MORE. BOOKS at my house. And so we sorted out the books. Some were really old and dated and we threw them in the recycle bin in the garage. I kept one box of books- a few best sellers that I had not read and then some books that I thought I could give away at school. We had seven or eight boxes of books to give away. I had hoped to take the books somewhere over Spring Break (still a week away) but my brother-in-law wanted them out of the house right away, so he loaded them into the back of my car. The Denver Public Library has a big sale every summer, and I thought I could donate them there. In the past, I have taken boxes to the library sale. You can do it any time throughout the year and all you have to do is take them to your local library and they will send them downtown. I left Colorado Springs about 2:30, intending to drop the books off at the library on my way home. On the way I called the library to find out what time they closed. I explained what I wanted to do and they told me that they were not equipped to take such a big donation at the local branches and I would have to take the books downtown to the Central Branch. The person in charge of donations didn't work Sundays. Even so, I called her and left a message. She called me back on Monday. I just need to give her 24 hours notice. This week was super busy, though, and I didn't have time to go down to the library when they were open. And so the books are still in my car. And it's been a hassle. On Tuesday, I skipped a trip to the Food Bank to pick up snacks, because I had those boxes in my car. Yesterday, I had to unload three boxes to get to the extension cord I always carry in case I need it to teach class. And today I have to go back to Colorado Springs. And my sisters will get mad if I don't have an empty car to help with getting stuff out of my mom's house. And I am really not up for dealing with my sisters' wrath today. I'm thinking, then, that I am going to need to unload all those boxes and leave them in my living room. Next week, when I have a little more time, I hope, I will load them back into the car and take them to the library. In my next life, I'm going to be a lover of something lighter- maybe marshmallows or potato chips or buttons. I watch as Joyce whirls around the dining room, a human tornado let loose. "Hi George, tonight's special is the herb roasted chicken with scalloped potatoes and green beans. Looks pretty good. Is that what you want?" "Grace, let me sit you on this side of the table, so you can hear Winnie with your good ear." "Robert, you ready for some ice cream? Chocolate, right? You want caramel on it tonight?" "Winnie, you want some orange juice? Special tonight is herb roasted chicken. You want a leg?" "Dee, where are you going? If you're gone too long, I'm going to take that plate?" "Hey, Gene, you gotta go back upstairs and work on your sermon? It's already done? Did you read that book I gave you? I tried fasting a couple of times, but I like my food too much. I have a friend who did it for four days, though, she's a big girl. She said she could have done another four. Not me, I like my food too much." "Oatmeal raisin cookies? Let me see what I can find. I'll bet there might be one or two hiding back there." "Hi Ralph, let me grab a root beer for you." "Robert, the nurses haven't come for you yet? Let me call them and tell them to get down here, that you are waiting." "Yeah, Louise, this whole meal is gluten free. Don't have to worry tonight." "I know you don't like scalloped potatoes. You want a baked? With a little butter and sour cream?" "Charles, you want some peach pie? It's still warm." "You can't hear me, June? That's ok, I didn't say anything bad about you." "Lee, you gotta get down here faster when I call. Mrs. Crowder's meal is waiting. She wants it hot." She throws back her head and laughs when someone asks her if the band aid she is wearing is covering up a hickey. "Good Lord, no," she says. "Do you know how old I am? Do I look like I have time for hickeys?" In between revolutions around the dining room, Joyce stops to talk to my mom, who has only been eating in this dining room for a couple of days. "Hi, Janet, how are you? No, you don't have to eat that chicken if you don't want it. Let me get you a menu from the other dining room." We chat and I learn that Joyce is 53 years old. Has been a waitress for 30 years, 18 of those as the only waitress on the floor at a 128-seat truck stop. Has been at the assisted living center for 18 months. Does not take tips. If anyone had told me two months ago that I would be sitting in the dining room of an assisted living center eating dinner with my mom, who is now using a wheel chair, they could have knocked me over with a feather. It's been a hard, hard, hard six weeks. Even so, I grateful for the people that I have met along the way. Joyce knows every one of the 30 or so people that come into the dining room by name. Knows what they drink and what they like for dessert. Is incredibly kind. And caring. Gives my mom sugar cookies to take to her apartment when she says she doesn't want dessert because she might want something a little sweet later. It's people like Joyce who are making this journey even a little bit bearable. SLICE #20- More parenting from afar. A dog?!!!??? We are in the middle of state testing. I have proctored my assigned math session and then a makeup test and now I have about five minutes to throw down my sandwich before I head outside for lunch duty. I check my phone and discover four messages from my son. I immediately assume the worst. I just talked to him the night before. And he usually doesn't want to talk to me all that often. I wonder if there has been an accident or an arrest. I glance at the clock and call him back. Uh-oh. That's not usually good question. Has he failed a test? Dropped out of school? Been in an accident? "Well, um, K (Son #2, who is visiting Son #1 for his spring vacation) was outside and he saw this lady playing with her dog and he asked if he could pet it and um…"
Again my mind immediately jumps to worse case scenario. What could have happened with a dog? A dog bite? Son #2 was bitten by a dog? "And um, the lady said she didn't want it and K could have it and he told her he didn't want it, but she was just going to let it run loose and so we brought it inside, so it would be safe, and it's here now." "A dog? A dog is at your apartment? What kind of dog?" "A pit bull and boxer mix. It's a girl. Her name is Sheba." Anyone who knows me at all knows I am a total dog lover. I have two, a food-crazed black lab and my mom's white malti-poo, who seems to be a permanent house guest. "You need to get rid of it Zay. You can't have a pet in the apartment without paying a deposit. I can't pay a deposit and you don't have any money." "I don't want to get rid of it. She's been here for two days. I thought you liked dogs." "I do like dogs. I like dogs a lot. But you can't have one in the apartment." "Lots of people have them in the apartment. I see them all the time." "But they have probably paid the deposit. And I can't do that. And you don't have a job." "I thought you would think it was a good thing. We were trying to help this dog so she didn't get run over. And you like dogs." "I do like dogs, sweetie. But you can't have one in your apartment. You need to give it back or take it to the pound." "But I want to keep her." "You have to walk dogs, and feed them, and take them to the vet. And you don't have a yard. So you have to take it out. A lot." "I'll do that. It will teach me responsibility." "You can't have a dog in your apartment." "But I want to keep her…"
I look up at the clock and realize I am five minutes late to recess duty. "Sweetie, I have to go. You can't have a dog until you can pay for it. Period. I love you." "I want to keep her. And I'm not a Christian." What? How did not having a dog connect to not being a Christian???? "You are a Christian. You made that decision ten years ago and once you've made it, there's not going back. You might not be a follower, but you are a Christian. And now I have to go. I will talk to you later. Bye. Love you." I hang up before he can add any more to this dog ownership turned theological discussion and sprint outside to middle school recess duty. I stand there trying to collect my thoughts. A dog???? He never even was really excited about our dogs. A dog would be a good companion for him living all alone in that apartment. He isn't allowed to have a dog. And the pet deposit is outrageous. Like $500. But it would be good for him to have a friend. You love the companionship. A dog??? It would probably not be housebroken and I would have to pay for new carpet. Maybe he would take care of it. Maybe the responsibility would be good for him. A dog? It would probably chew up the cupboards and I would have to pay for them. But they thought they were doing a good thing by taking the dog in. You always wanted to raise compassionate, caring sons. Yeah, but not a dog. Not in the apartment. It would get sick and I would have to pay for it. Later, as I drive home from work, I talk again, to both my son and his brother. I explain my bottom line- dogs are a commitment, a financial responsibility. We would have to pay a deposit. He would have to buy food. Most weeks he can barely feed himself on what I give him and I don't have any more. The dog would need shots. It might get sick and he couldn't pay for it. And dogs are a time commitment- they have to be fed. Walked. Loved. Taken outside. Often. And the outcome of our conversation is the same. He wants a dog. I love dogs and do not think it's a good idea for him right now, at least partly because I can't afford to help him pay for it. We hang up with the issue unresolved. And I wonder if there will ever be a day that this parenting stuff is easy. In my next life, I think I will just do dogs. OK, enough sad slices. A funny one for today. Tuesday at noon. In true Colorado fashion, it has already snowed, rained, sleeted, and now it's snowing again. We are having indoor recess. I am on auditorium duty with the middle school kids. The assistant principal has set up a bloopers video and the kids are relatively calm (with middle schoolers, on indoor recess days it's all relative). I should say here, I adore our middle school kids. I love hearing about their lives. And their latest romances. I love talking books. I love writing with them. They make me laugh a hundred times every single day. Except every once in a while, I don't love them. Chuckie, a seventh grader, has been known to have issues with adults, but he and I usually do pretty well. He calls me Willie. Today he races into the auditorium, flies across the room, slides across a table on his belly, and ends with kind of a twisting move, flinging his legs into the air. Several of the seventh grade girls dodge his flying legs, and one gets kicked in the cheek. "Chuckie," I say, "Go back…"
I don't get to finish before he starts in, "I'm not going back downstairs." I try again. "You need to…"
Again he interrupts, "I'm not going back downstairs!" His voice is several decibals louder. I drop my voice. "I need you to…"
This time he shouts at me. "I'M NOT GOING BACK DOWNSTAIRS!" By this time, I am realizing that I have walked right into one of those scenes Chuckie is famous for creating. "Hey," I say, trying to make eye contact. "Not okay. What's going on?" Chuckie responds with a belch. And not just a little belch. Easily the biggest, loudest, longest belch I have heard in my two year middle school career. A belch that would make my two sons, famous belchers in their own right, whistle in awe. And it's right in my face. If it wasn't so incredibly disrespectful, it would have been really funny. I stand there for a second, then point toward the door of the office, across the hall. "You need to go to the office," I say. This time I am the one who interrupts. "Go now." Chuckie knows that I am serious. He complies. I follow him into the office, and watch as he proceeds to tell two other social deviants that he has been sent to the office because he "accidentally burped" while he and I were talking. I stick my head into the principal's office to tell her why Chuckie is there, then have to shut the door because I don't want him to hear me laughing. My plan is to let him cool down, then deal with him after recess, but she says, "Send him in." Chuckie goes into her office and I go back to the auditorium. Ten minutes later, I am paged on my radio. "Carol, or wait, Willie, can you come to the office?" Chuckie is ready to apologize. "I'm really sorry," he says, "I was disrespectful and it won't happen again." "Apology accepted. But you weren't disrespectful. That belch was beyond disrespectful. That was rude," I say. "And gross! And disgusting!" "I know," he says, and again, I can't help laughing, as I think of that giant belch. We shake hands and then he gives me a hug. "I'm so sorry," he says again. And he really is. My mom has always been one of the smartest people I know. A working mom because she couldn't stand to stay home. My mom has always been a go-go-go-er. The theater. Symphony. Bridge clubs. Dinner with friends almost every night. My mother has always been a reader. Literature. Best sellers. Romance novels. My mom has always cared for a zillion people. Volunteered for charities- the first to arrive and the last to leave. Driven friends to doctors and chemo appointments. The one people always asked for help. Told me she loved me. POST #17- A WHOLE LOT OF WONDERING. My mom has been in her new home about ten days. Unfortunately, it's not going quite as smoothly as we had hoped. The doctors assured us the surgery had been successful. That my mom would just continue to get stronger. And that she would be fine living by herself. That's not been entirely true. Take yesterday, for example. I left Denver at 6 am and arrived at my mom's place around 7:30. She was sitting at the kitchen table reading the paper and drinking coffee. She needed a few things from the grocery store, so I ran to the store, then met my sister, Betsy, at my mom's old place to do more packing. On Saturday, we did the kitchen. Our goal for yesterday was books (I know where I inherited my bibliophilic gene from). Betsy, my brother-in-law, Paul and I worked for about four hours, then headed back, with full cars, to my mom's new place. We had lunch, unpacked the cars, and hung some pictures. Things seemed to be going ok, but then the trouble began. My mom was sitting in a chair in her bedroom watching us hang pictures. When she went to get up, she had a lot of trouble. She said her legs weren't working right. She seemed to be having problems using the walker correctly, even though she had done fine with it on Saturday. My sisters and I weren't quite sure what was going on. Was something wrong with the shunt? Did we need to go back to the hospital? We decided to give it a few minutes and see what happened. We got my mom settled in her chair in the living room, then my middle sister left to go to my mom's place, to give away some furniture. We were afraid to leave my mom alone, so we decided that Betsy would stay. I headed back to Denver, crying all the way, to drop all of the books off at the Denver Public Library for their summer book sale. When I got to Denver, I texted my sister and things seemed to be going better. My mom and sister had both had naps. My mom was sitting on the couch. Betsy left to go home; my other sister, Nancy, was going to stop and help her get ready for bed. Shortly after Nancy left, she got a phone call. My mom had fallen trying to get into bed. She wears an alert button and Nancy told her to press the button, so that someone from the front desk would come up to help her. She wasn't hurt, just scared. Both my sisters headed back over. Betsy ended up spending the night and most of the day today. She didn't go to work, again. She and my brother own their own company, so she can miss more easily than Nancy or I, but it's definitely less than ideal. At this point, we are wondering whether my mom really will be able to live on her own. We wonder whether she needs an actual assisted living apartment at this facility (right now she is in the independent living wing). We wonder if we should get a CNA, at least part time, until my mom gets a little stronger. I wonder if my sisters' lives will ever get back to normal. I wonder if I should try to sell my house and get a job in my mom's city, which is 90 minutes south, so I could help more. The doctors assure us that things are going well. The occupational therapist reminded my sister, today, that my mom's brain has undergone a great trauma, and it needs lots of rest and quiet. More than two people in the apartment is too many. More than one activity (and just going to the dining room is considered an activity) per day is too many. She needs to take lots of naps. We need to be patient. She thinks she will be ok, but it will just take time. Saturday night. I was on the road to my mom's house at 5:30 this morning, spent the morning packing boxes at my mom's old house, took stuff to my mom's new house, then got back to Denver about 4:30. I know a similar day is waiting on Sunday. Even so, I contemplate getting back in the car and making a 45 minute drive west to Boulder to the state basketball championship. My boys' former high school is playing and I'd love to see the game. Besides, state basketball is kind of a tradition in our family. We've been going since the boys were in third or fourth grade. When they were little they would sit wide eyed, imagining themselves as high school basketball stars, breaking only long enough to beg money for nachos and dipping dots. As the boys got older, they moved to riding with me, but hanging out with their friends. The last couple of years the boys have gone with their friends and I've gone with mine, and watched them from afar. Nevertheless, we've all been at the game. I can hardly imagine not being there. I go back and forth trying to decide whether I should go to the game. I peruse the paper and discover that the game is being televised, so I decide to go that route instead. I call son #2 to tell him that the game is on and he asks me to text him after every quarter with the score. I text after the first two minutes. The other team is up 6 points. After a quarter the game is tied. At halftime we are up by 5. After three quarters we are up by 13. Ultimately we win by 20. The East Angels are state champions! I text my son with the final score. State basketball is a tradition in our family. Friday night. I am commenting on slices when the little rainbow wheel starts spinning. I have that problem pretty regularly and usually all I just have to force quit Firefox, open it again and I'm back in business. Tonight, though, that little trick doesn't work. I can't get Firefox to force quit. The little rainbow wheel just keeps spinning. Finally, I decide if I turn off the computer and then turn it back on, that might solve the problem. I turn the computer off, but when I turn it on again, I have a new issue. The apple comes up in the middle of the screen, and this other spinny wheel comes up, but that wheel just keeps spinning and spinning. I never get to the main screen. I turn the computer off and on several times, but still no luck. And so tonight I am slicing on my iPad. I have a brand new iPad and I am not very good with it yet. I have fat fingers. I do not have a keyboard. I do not know how to post an image, so the slice symbol is not here. On Monday, I will take my laptop, which actually belongs to my school, to the computer teacher. I hope he will fix it. In the meantime, I am posting this kinda slice because it's the best I can do. I'm participating in Slice of Life at Two Writing Teachers. And it's Poetry Friday at Rogue Anthropologist. And I don't think it's done, but it's the best I can do for now. We've been doing state tests all week. As a literacy coach, I often administer makeup tests. This week I've worked with kids who are just coming back from illnesses, who have missed school for funerals, who couldn't test with their class for behavioral reasons. Whenever I have to give these tests, I'm struck by our world's measures of proficiency. I teach kids who live in abject poverty, who fear daily that parents will be deported, who have really, really hard home situations, and yet these kids still smile and persevere and find hope and joy. And yet there success is measured by tests that often label them as partially proficient or unsatisfactory. And we as teachers, who wade daily into this fray, are told, again and again, that our efforts are less than adequate. As I work with these kids, and with an amazing, giving, deeply caring group of colleagues, I can't help but measure whether we, as a society, truly have any grasp of what really matters. That's where this draft comes from. and her mom made her go back home. he exclaims to his friend. se come a la gente. "it's one of the best ones I have written"
and now speaks out to teens. It is still dark when I pull into the school parking lot at 6:30. Although the staff at my school tends to be a bunch of early birds, this morning, there are only a couple of people there before me- the office manager Judy, Marcy, who manages the lunchroom, and Angel, the assistant Facility Manager. I turn off the car and start to climb out. But I can't. The weeks of testing get harder to swallow every year and this has been an energy draining, soul sucking week. The issues with my mom have been so hard. The constant worry about my boys, even though I know I am not supposed to worry about anything, have been so hard. I am so tired. I climb back into the car. I need a treat. Now I should insert here, I'm a single mom with two kids in college. I have to be super, super super careful with money. There isn't a lot of room for treats. In fact, most of the time, there's none. Most days I fill up my little red coffee cup at home and carry it with me to school. And it's fine. But once in a while, a gal just needs a treat. I head for Common Grounds, the neighborhood coffee house. I buy myself a large coffee, with room for cream. Dump in a packet of the brown kind of sugar. Snap on a lid and head back to school in time for a 7:00 meeting. Somehow, the boilers in the school did not get turned on this morning and the building is cold. I breathe in the rich coffee smell. I hold the warm cup in my hands and then let that warmth slide down to my innards as I sip. Once in while, a gal just needs a treat. "This novel is based on the chilling true story of a young family caught in the middle of political corruption and unspeakable violence during Guatemala's 36 year long civil war. Tired of watching city workers endure countless human and civil rights violations, Alberto organizes a union, then finds himself on the government's 'extermination' list…"
It's actually kind of an interesting story and the text is really supportive of me as language learner. It's told entirely in present tense. There's lots of repetition. The book includes a lot of cognates (words that are similar in English and Spanish, e.g. preocupada=preoccupied or worried, caos= chaos). It's not that hard to understand. It's only about sixty pages (ten chapters). If I read two chapters a day, I could easily finish the book. My Spanish teacher, Señora Rowan, insists that if we read the books faithfully, our Spanish will get better. I really want my Spanish to get better. I really need my Spanish to get better. I'm paying money I don't even really have to take the course. Why, then, am I having a hard time motivating myself to read? I've had ESPERANZA for two weeks. I'm only about halfway through it. And that's because I made myself sit down and read for an hour tonight. I can't help but think about the kids I teach, especially the middle schoolers. Our situations are actually very similar. The middle schoolers are expected to read every night. We have books that are interesting and fun to read. We have titles on almost any subject, books that are super easy and books that are super hard. We have poetry, graphic novels, historical fiction, dystopian fiction, etcetera, etcetera, etcetera. And yet some of them, lots of them, still don't read, or at least not willingly. And so I'm sitting here tonight, with my little Spanish novel, wondering what I can learn about home reading, how I might make it more viable for kids, especially kids that struggle, and how I can get myself to read in Spanish every night. Because I really want to get better at Spanish. As much as I want them to get better at reading. Tonight I am test tired. Test tired is really, really different from teaching tired. Teaching tired is a good tired. Teaching tired is good tired. The memory of a great read aloud. A writing conference that moved a kid forward. A laugh shared with a sixth grader. I am not that kind of tired. I drag myself in the door at 7:15, having left more than 13 hours earlier. When I walk in the door, I immediately notice a pile on the floor in the closet alcove to my left. The non-working antique clock, which had been on the shelf in the closet is on the floor. My first thought is that my house has been broken into. I mentally catalogue what was in that closet- winter coats, vacuum cleaner, mop bucket, extra three ring binders-- and I wonder what might have been stolen. And then I realize what really happened. Yesterday, when I got home from my mom's house I was pretty tired. And I had a full car to unload. And a lot of schoolwork to do. In addition to all of the treasures I wrote about yesterday, I had brought home some clothes my mom wanted me to try on. I live in an old house, with little tiny closets. My bedroom closet is totally full. I knew the new clothes wouldn't fit in that closet. So I ingeniously, or so I thought, decided to hang them in the coat closet in the front hall. It never occurred to me that that would be a problem. But I guess it was. Evidently, the clothes were too heavy. They pulled the clothes rod and shelf right out of the wall. And everything hanging on the rod and everything on the shelf above it, is now on the floor of my living room. I sat down on the floor and cried. And then I took the dog for a walk. The clothes are still there. They may still be there in June, when school gets out. Because I am too tired to care. My sisters and I are beginning to clean out my mom's patio home. She's lived there for about twenty years, and it's 3,900 square feet, filled to the brim with treasures my mom has collected. And it's in this cleaning out that I am remembering how very different my sisters and I really are. If you were to put the three of us on a spectrum, with one end being someone who doesn't like to get rid of anything, and especially not anything that has the least bit of sentimental value, that's where you would find me. And at the way opposite end--someone who purges everything and has no interest in hanging on to anything with sentimental value-- that would be my sister, Nancy. My youngest sister, Betsy, would fall right in the middle. It will be the fourth time. And he still has not passed it. I hear the discouragement, the flatness in his voice. "I talked to the professor," he said. but I have to get 100% on all of the rest of the tests." "The teacher said I can stay," he says. "I can try to pass." see if they have someone who can help. any better than he understands math from a teacher. "Maybe I will do better this summer. When I only have one class" he tells me. "I did better last summer in that writing class." We talk a little longer. Discuss the possibility of a tutor. might be willing to help him. I tell him to ask. Tell him I will pay. And then it is time to hang up. I try to build him up. when it's been so, so hard. and I am filled with doubts. is sooo hard for him. be able to pass Algebra. I wonder whether the college thing is really right for Zay. He's much happier working with his hands. I wonder if some kind of trade school might be better. But he really, really wants to play football. Football is his happy place. I do not want to be the one to pop that dream bubble. Yesterday, after 18 days, my mom was released from the hospital. Except she didn't go home. At least not home to the place where she has lived for the past twenty years. Instead, she moved into a two bedroom apartment at a senior center. One of my sisters spent the afternoon with my mom with yesterday. My other sister spent the night. And I took the day off from work today. I got there just a little before eight. My mom and sister had just finished breakfast in the dining room/restaurant and were waiting for me in the lobby. We went up the elevator to my mom's apartment on the second floor. My sisters and brother-in-law have done a fantastic job getting the place together- since last weekend, they've bought a new couch and chair, moved beds, dressers, dishes, sheets and towels, and just generally made the place home. This morning, I talked to the hospital billing department. And went to the grocery store. And cleaned up a little bit. Then my mom and I went to the dining room for lunch, exchanged her medical alert necklace for a medical alert bracelet and looked for the library (a girl has to have her priorities, ya know?). I had planned on staying for the afternoon, but a Colorado snowstorm blew in, so I headed back to Denver about 3. I think the new living situation is going to be good for my mom. She has her own space, but there's an alert button in every room if she needs help. She has a kitchen, but she can eat meals in a dining room if she wants to. There's a bus for group events and a driver for individual appointments and meetings, which will be good, since my mom can't drive right now, or maybe ever. And there are people around and all kinds of clubs and activities and things to do. At the same time, the whole process feels a little like leaving a reluctant five-year-old at the door of the kindergarten classroom. You know, one of those kids that watches everyone painting or building with blocks or writing stories, but hides behind her mom, not quite sure she wants to try it out herself. My mom is that five-year-old right now. She's not quite comfortable, yet, with going down to the dining room by herself. She hates using a walker and is embarrassed to have her friends see her. She doesn't know whether she will try any of the clubs and activities. She misses her independence. I close her door this afternoon and walk away with a huge lump in my throat. I wonder how long it will be before my mom will jump in and get comfortable in her new life. Thursday night means Spanish class. My friend Kathy and I leave school at 4:15, drive across town through rush hour traffic, and usually arrive just in time for our 5:00 class. Kathy has never spoken Spanish. She took a weekend class about a month ago, and then signed up for the Thursday night classes. She really should be in the beginner class, but she has another commitment on Tuesday nights, so the group offering the classes suggested she should take the intermediate class. I speak a little more Spanish than Kathy, but still have a long, long way to go. For me, the intermediate class is about right. We've only gone a couple of times, but so far it seems like the class consists of several different segments. It starts with book check in and out. Then there's a story, usually something about school. Last week the story was about a teacher calling the parents of a student named Victor. Victor was very naughty. he hit. Bit. Pulled hair. It turned out his mother was a roller derby queen. Tonight, the teacher was calling the parents of another child, a girl named Cecilia. Cecilia's father thought something was wrong-- and then it turned out that she was calling to invite them to the science fair.There's usually a vocabulary lesson. A music segment. And conversation time. Every week at Spanish class, I am reminded of some big truths about teaching. 1) Learning is social. Kathy and I go together. I know, even when I'm exhausted and would just like to go home, that Kathy is expecting me to go with her. 2) Sometimes it helps to front load. Last week was really hard for Kathy. She doesn't know much Spanish. She didn't understand a lot of what was going on. Last night after school, we sat down with today's lesson. We practiced the vocabulary. We read through the story, talked about it, and worked a little with key vocabulary. Tonight Kathy felt much more comfortable in class. 3)An experienced mentor helps. During the story segment, the teacher does most of the talking. I like listening to her. It helps me know what Spanish should sound like. 4) Like ability partners are not always helpful. We always spend part of the time working in conversation partners. While I appreciate this opportunity, I don't know how helpful it is. None of us are fluent Spanish speakers. Most of us have issues with vocabulary, and verb tense, and pronunciation. We are practicing, but we are really not getting any feedback, and I'm not sure that's it all that beneficial. 6) Laughter matters. Our teacher has a great sense of humor. We laugh a lot. Which makes us relaxes us. And makes it much easier to learn. I love Spanish class. I love that I'm learning something new. And I love that placing myself in the position of learner helps me to think carefully about my own teaching practices. The text comes in around 6:30. Son #2: What am I doing for spring break? I have been asking this question for several weeks, but with only minimal response, "I don't know. I'll let you know." And now: What am I doing for spring break? This seems like a conversation that might be easier to have in person, and so I dial his number. Even though it's been less than a minute since he texted, I am surprised when he answers his phone. Son #2 is not the most conversant guy I know. We talk briefly about Spring Break, about school, and about his new job as a car hop at a fast food place. I think we are about done talking and I am about to hang up, when K says, "Wait. I want to ask you about something. I mean, I'm ok and school's ok, and everything, but I just want to ask you about something." My heart beats a little faster. I wonder what he wants to ask about. "Well, see, there's this guy. A teammate. He's kind of crazy. I've talked to you about him before. He's the one that drags his girlfriend around by the hair." I do know about his kid. In October, when I went to see K, he told me about several incidents with this player and his girlfriend. He said the kid was abusive. Wondered what he should do about it. K continues talking. "So anyway, a couple of weeks ago, he and these other guys got drunk and started kicking in doors. And they got arrested and a couple of them are in jail. They've been there two weeks." My heart beats faster still. "I wasn't involved or anything, but they want me to put the title of my car up for bail, so they can get out of jail." I am shocked. "What? Your car?" I don't even have to think about this one. "Absolutely not!" I don't totally understand the ramifications of putting one's car title up for bail, but I am pretty sure it's not a good idea. "Well that's what I thought. But some of my teammates keep calling and texting me. And the kid's mom even called and asked me to do it. They are saying I'm not a good teammate." I try to stay calm. We talk for a few minutes about possible ramifications. About the meaning of team. I suggest that K go and talk to the coach and explain what is going on. And then I think we are ready to hang up again. But then K says, "So I talked to Coach Burton." "Yeah?" I say. Coach Burton was K's quarterback coach in high school. It was his connection that took K to where he is now. Last I heard, Coach Burton was interviewing for a position at a college in Colorado. He wanted K to apply there. "He wants me to join the Air Force," K says. "He says I will probably never make it in the NFL and I should just join the Air Force now, so I can start making money." And for the second time in this conversation, I feel like I have been socked in the stomach. I fight to stay calm. My boys' mental health has been a hard war. I cannot imagine sending them to Iraq or Afghanistan. I wonder if the fragile, hard fought inner peace could survive something like that. "Really? What do you think about that?" "I don't know. I don't think I want to do it. I don't want to go to war." "Well then don't do it," I say, more than a little relieved (and also feeling really selfish when I think about all the moms that actually are sending their sons and daughters to war). "But I don't know why he would say that. He sent me all the way out here. And now I'm here and he wants me to drop out and go to war. I don't get it." I don't really get it either, but I try to listen as K thinks aloud for a few more minutes. We talk about the difference between jobs and careers, and careers and hobbies. And then finally he is done. Tells me he loves me. Hangs up. And I stand in the middle of the kitchen, holding the phone, pretty sure I missed another page in the parenting manual. Exactly one week until our state's "blessed event" and the heat is on. Writing workshop has disappeared and we are writing and writing and writing, but it's all to prompts. Today I am in fourth grade students are writing to a prompt about what they want to be when they grow up. I make the rounds, conferring with J, who wants to be a WWE wrestler, then P, who has aspirations of becoming the guy who wears the Chuckee Cheese suit, and R, who wants to play for the NBA. Finally, I kneel down next to L, who barely looks up when I kneel down next to him. L is an English Language Learner. And he has a visual memory problem, which makes reading, writing, and spelling really, really tough. I look over his shoulder. Almost every word, even words me and my are spelled wrong. And even though he's in fourth grade, L is still reversing his b's and d's, which makes it even tougher to read his writing. I take a deep breath. Try not to think about the tests. Listen for Don Graves' voice in my ear. "Always respond to the content first. Let the writer know that you hear what he has to say. I read L's first paragraph with all the expression I can muster. Wot du u wont to di wen you grow wp? I wud lake to be a titur becos its fon to lon. Onodor risin I wont to di a titer is we could majc jocs with prodloms. Onodor rison I wont to di a ticr is to play gaims in math and odr things. I like when kids rid cuaiet. I want to dia tichr dicos I could si kids lafing dat maics my japy. Translation: What do you want to be when you grow up? I would like to be a teacher because it's fun to learn. Another reason I want to be a teacher is we could make jokes with problems. Another reason I want to be a teacher it to play games in math and other things. I like when kids read quiet (ly). I want to be a teacher because I could see kids laughing. That makes me happy. I look up from the writing. L is watching intently. "So you want to be a teacher?" "And you are going to tell jokes and make kids laugh?" L nods. "Kids will love that. People love to laugh. " L smiles a little more broadly and I keep reading. L wants to be a teacher because he wants to make learning fun for kids. He likes when they learn something new. He likes to watch them when they play outside. L goes on to clarify a little. He wants to be a teacher "when he is tall, not when he is small, because he doesn't know that much about teachers right now." He thinks that if he became a teacher when he was small, kids wouldn't listen to him. And they "always talk when they are working and never respect the others all around them." I compliment L on his thinking. Tell him that I know he will be a great teacher. Make him promise that he will come back and teach with us at our school. He grins and nods happily. And then I have to teach something. L already has an introduction and a conclusion. He organizes his writing. He uses paragraphs. I don't even know where to begin to tackle the spelling. And so I teach a really simply trick about b and d. I draw a picture of a bat and ball. I show L how he can say, "First the bat and then the ball." Then we talk about how when a dog comes around the corner, you see the head first, then the tail. I show him how to make a d by saying, "First the dog's head and then the dog's tail." And L goes back through his writing and finds every single backward b and d and corrects it. We also talk about the difference between the e sound in English, made by an e and the e sound in Spanish, made by a letter i. L fixes everyone of those too. I don't touch L's last line, because it's already absolutely perfect. "I wont to di a ticr dicos it's the dest jod in the wruld." I agree, L, I totally agree. It really is the best job in the world. Mostly because of kids like you.